The E-Cigarette Liquid Acrylic Display is perfect for any retailer who requires a compact merchandising display for a range of E-liquids. 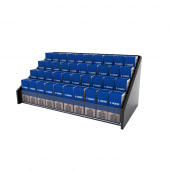 The unit has four separate tiers where you can store up to 10 boxes of E-liquids per row. This tiered design ensures customers have full visibility of your products, while its compact size saves space on counter tops and inside cabinets. The unit has an outer black frame constructed from 5mm thick acrylic. The internal tiers are made from 3mm clear acrylic, allowing customers to clearly see each product. Can I use the e-cigarette liquid display merchandiser for holding other products? 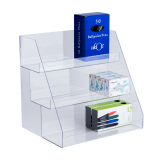 Although the acrylic display stand is primarily designed to hold E-liquids, it could also be used to display small items such as lipsticks or nail polish on a counter top. A standard e-liquid box measures 2.8cm W x 6.5cm H x 2.8cm D.
Overall Size 30cm x 14cm x 16cm 11.8" x 5.5" x 6.3"
Internal Size 29cm x 14cm x 15.5cm 11.4" x 5.5" x 6.1"